SoftPlanet makes it possible for everyone to get free Auslogics Registry Cleaner download directly from our servers. There is no registration needed for downloading. 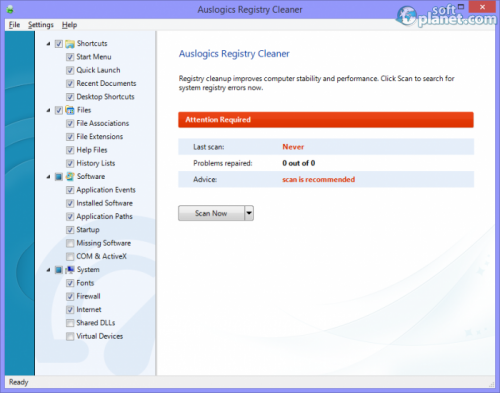 Auslogics Registry Cleaner 5.2.0.0 is a free program which can heal all your registry problems. It is designed to be very fast and efficient product which will not require from you any intervention but to run it. Of course you can perform safety registry backup before you launch it. Keep in mind that the way you treat your PC the same way it will perform. Your computer, like anything else these days, deserves to be treated with the best available tools. The program, which is an object of today's review, is free of charge and can be downloaded on any computer. You can install Auslogics Registry Cleaner on Windows XP, Vista, 7 and 8 no matter is it a 32-bit or a 64-bit version. The whole idea of this type of programs is to maintain your computer registry error-free and remove from them all useless parts, entries and values. Obsolete or damaged data can be ignored and thus your PC can increase its speed and it can run more stable. Before each scan the program creates a full registry backup which can be used at any later time to restore all the registry settings. Auslogics Registry Cleaner has a user interface which most of you will like. The left side of the program window has a list of all possible scan locations which are grouped in four main categories: Shortcuts, Files, Software and System. 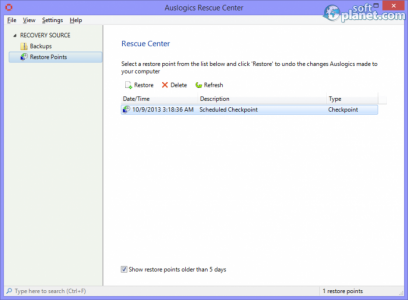 Through the File menu, you can access Auslogics Rescue Center, which is used to help you to restore Windows registry back to the time when the backup was created. You can take a look at the details of each one of the records before you perform that operation. You can click on the Scan Now button to run Auslogics Registry Cleaner or you can expand the drop-down menu of that button and choose Scan and Repair. The difference between both is that the second one automatically repairs all discovered problems. There are not too many program settings which you can change, but this is not the point of the program. It actually pretends to be an app which can do everything without a single intervention by your side. 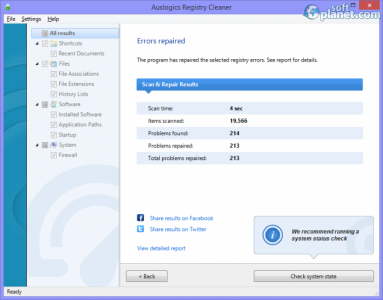 If you want to get rid of any registry problems, we advise you to try Auslogics Registry Cleaner. This powerful and reliable tool can compete with CCleaner, Advanced System Care, Wise Registry Cleaner and Wise Care 365 Free without any problems. And not only that, but also it can overtake them all with ease. We strongly recommend this very efficient application to all users who struggle, because their Windows registries are not in order. Auslogics Registry Cleaner is VIRUS-FREE! 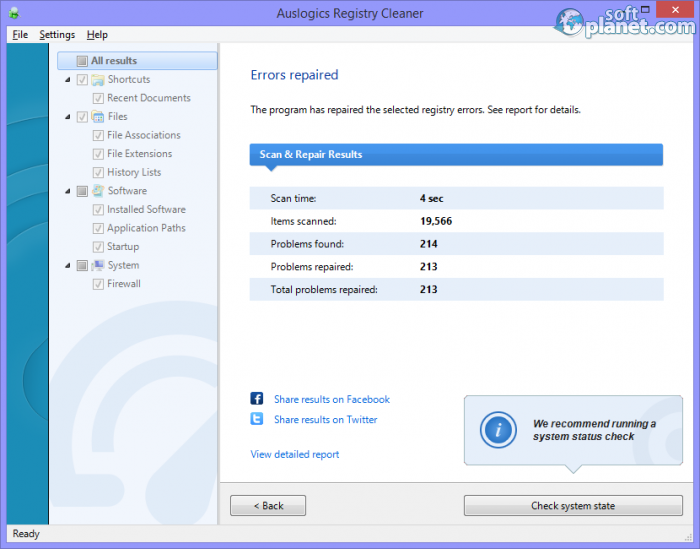 Our security scan shows that Auslogics Registry Cleaner is clean from viruses. The current version of Auslogics Registry Cleaner has been scanned by our system, which contains 46 different anti-virus algorithms. That ensures that Auslogics Registry Cleaner 5.2.0.0 is 100% safe for your computer.